In the late 1960s there arose great interest in restoring not just Mozart's notes to their Ur condition but also his instruments and even (insofar as these could be ascertained) the performance practices of the musicians of his day. This led to increasing numbers of performances on period instruments, either museum originals or modern replicas. 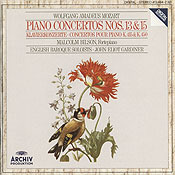 Two of the pianists most successful in this undertaking have been Malcolm Bilson of Cornell and Robert Levin of Harvard. 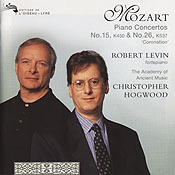 Both have recorded Mozart's concertos with period-instrument orchestras. Using Realaudio player (download if necessary), one may hear first Bilson, then Levin performing the passage whose history we have been following over a period of more than two centuries.